Mid century Modern designs looks modish with stylish furniture and palette of saturated colors are decorated in the interior. The interior design always reflects the personality and makes a great impression. The design creates a peaceful and calming environment. A bedroom is a place where you get relaxed at the end of the day. It should create a better mood so that your sleep lasts for long night and can get relaxed. The bedroom includes the bed with cushions and quilt, night stands with lamps, chest of drawers for storing accessories and walls of the interior are decorated with paintings, fabric textiles, gallery art, sconces, wall paper etc. The rooms also has couches for seating and a coffee table for serving. Here are few images of mid century modern style master bedroom which may be useful in decorating your interior design. This image views an outstanding mid century modern style master bedroom. The false ceiling is a dry wall ceiling with plain light fixtures and the flooring is made of dark wood with a textured blue carpet laid on it. The room has a leather bench and a mustard yellow chaise for getting relaxed. The room has night stand with chest of drawers for storing and has lamps, flower pots on it. The bed has cream elegant headboard with cushions and brown velvet quilt with wall cladding behind the head board. The walls are decorated with acrylic painting which is unique oil painting. The interior of this bedroom looks beautiful with all the elements in the room. The false ceiling is white striped plywood ceiling and the flooring is made of ceramic tiles with a glossy look. The room is decorated with casement windows where we can view a beautiful outdoor garden and are covered with two finger tab top draperies. The room has chairs with a table for serving and the room has closets for storing. The walls of the interior is decorated with the elegant sconces and has ikea gallery. There is a television mounted on the wall and has long chest of drawers for placing decorative items. The interior of the master bedroom looks bright with cherry red textures. The false ceiling is made of white ply wood under structured ceiling and the flooring has a smooth carpet which gives a cozy feel when you walk on barefoot. The room has platform bed with cushions and a velvet coverlet. There is a chair with a pillow for relaxing and can be used for reading a book. The interior has casement windows with the blinds and has night stand with the lamps on it. On the other side the interior is decorated with the two finger draperies. The room has a mirror with the cabinets to store accessories and clothes to hold in and has decorated with flower pots which gives a fresh look and creates a dramatic effect. The false ceiling is dry wall ceiling with plain light fixtures and the flooring is made of dark wood and a shaggy throw rug is laid on it. There is a ceiling fan attached to the roof and the room has pendant light sconces which illuminates the room. There is a bed with the cushions, quilt and has a comfy seated bench in front of the bed. The room has long chest of drawers with a lamp and has a long mirror which reflects the beauty of the room. The room has windows covered with the draperies and has chairs with pillows for seating. The wall has photo frames and has light green wall papers. This image views you a simple and inexpensive mid century modern style master bedroom. The interior is decorated with the stone cladding which gives a modish look. The false ceiling is made with laminated dark wood which is placed on the structured ceiling and has ceiling lights placed in it. The flooring is made of walnut wood which is popular and gives comfort while we walk on the floor. 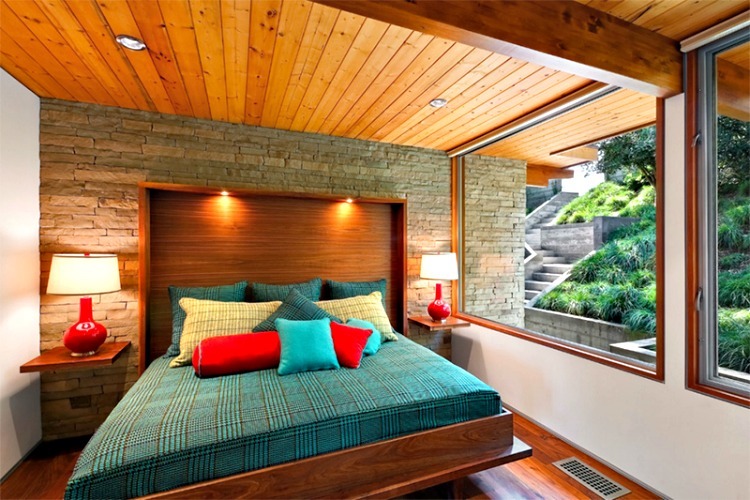 The room has a wooden bed with blue bed and has saturated color cushions and the stone cladding has wooden panelling with lamps on it. The interior has wooden cladding with lights and has casement windows for viewing the outdoor garden. The false ceiling is a dry wall ceiling with the lights fixtures and has a ceiling fan attached to the roof. The flooring is made of plain vinyl flooring with a glossy look. The room has a bed with quilt and cushions and behind headboard there is aluminium panelling attached to the wall. The room has night stand beside the bed and has lamps on it. The interior has a wardrobe for placing clothes and storing accessories and the wall has a beautiful painting mounted on it. The interior of the room has a cozy look. 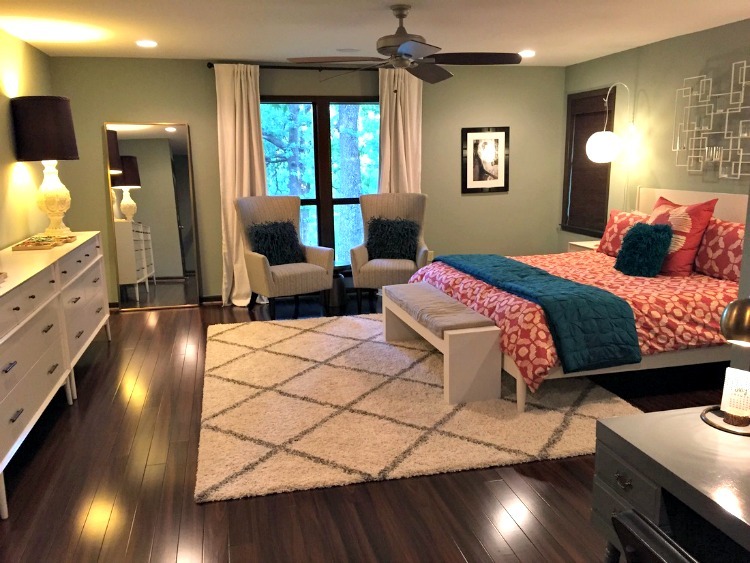 In the view of the image you can see a mid century modern bedroom with a neutral color. The interior is decorated with the soft beige color and the false ceiling is dry wall ceiling. The flooring is covered with a polyester plush brown carpet and has white framed casement windows which allows natural air and makes you feel pleasant. It is covered by the white sheer curtains. The room has a Hampstead style bed which looks exotic with light grey coverlet and textured cushions. The room has night stand with lamps and has metal made chest of drawers for storing. The room has vases and an abstract painting which matches the interior. The interior design of this master bedroom looks classy and the false ceiling is made of ply wood which is layered under the structured ceiling. A string light is attached to the ceiling and has a fan mounted on it. The flooring is made of laminated black wood which is covered with a textured plush carpet. The wall has a metal cladding with a design on it. The bed has a upholstered headboard with cushions and dark blue quilt on it. The room has a bench for seating and has a night stand with flower pots. The room has a table with a chair and can be used for reading. The false ceiling of the room is dry wall ceiling with simple light fixtures and the flooring has a plush carpet laid throughout the room. The room has casement windows and has a night stand with the lamps. The room has chest of drawers which has vase and candles placed on it. The room has an abstract painting which compensate the brown color wall paper. The bed has an upholstered headboard with cushions and has a bench for seating. The room has a chair for getting relaxed and the room looks amazing. The room has dry wall ceiling with simple light fixtures. The interior is decorated with snowy white color and has an abstract painting mounted on it. The flooring has grey plush carpet which is comfy. The room has a bed with head board and has white quilt and cushions. The room has chest of drawers for storing accessories. The interior has chairs with cushions for seating and the room has triple casement windows where we can see the beauty of the nature. The room has lamps and has wall cladding.